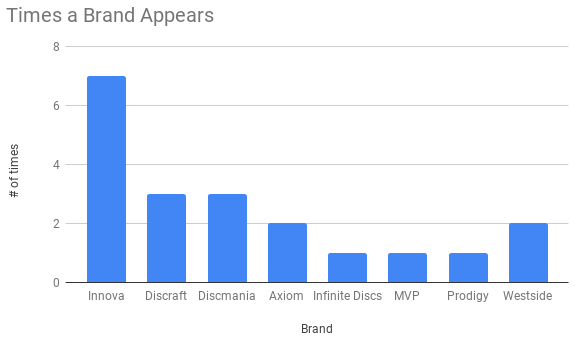 With a big restock of Discraft KONG discs hitting the Infinite Discs website, that disc rocketed to the top of the chart again, demolishing all of the competition. The 2nd place disc was the new first run Fuzion RAIDER by Dynamic Discs, and in all honesty, the sales of that disc would have been higher if we’d been prepared and had more of them in stock. The anticipation for the Raider was higher than we expected. The LUNA putter took 3rd place, pushing last week’s #1 Destroyer back to #4. Other honorable mentions go to the Infinite Discs RA which had a stock release and was on sale for the weekend, pushing it to #6 in Metal Flake C-Blend, and to #15 in C-Blend plastic. The newest putter from Dynamic Discs, the GUARD also stands out at #14. 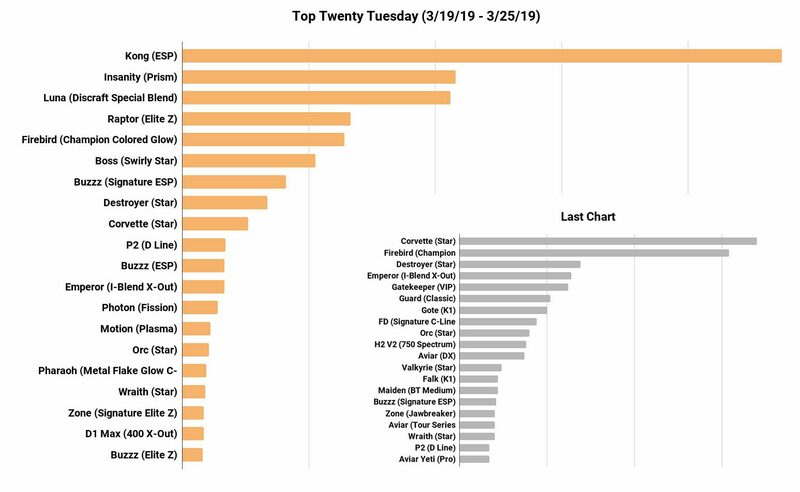 –> Each week we’ll invite you to leave a prediction for a certain chart position on next week’s TOP TWENTY TUESDAY report. 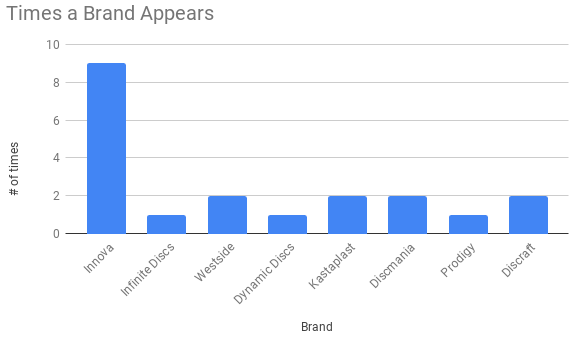 The person to predict that chart position correctly in the comments will win a $10 gift card for the Infinite Discs website. WINNER – The #4 spot this week was the Star Destroyer as it was pushed back by the hot-selling Kong, Luna, and new Raider. The first to guess Star Destroyer, according to comment time stamps, was JACK. A few other guesses came in for Star Destroyer, but Jack was the first, so congratulations! 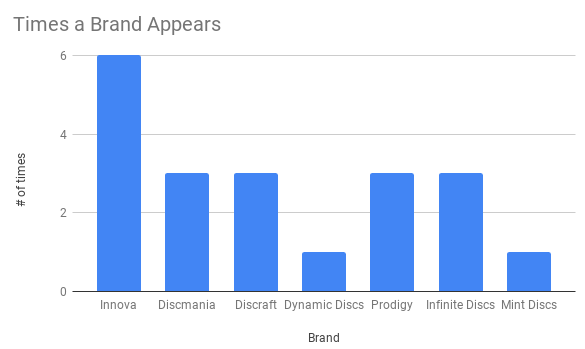 We saw a more “settled” chart during the last week as the Discraft KONG and LUNA vanished completely due to the fact that they completely sold out at Infinite Discs the week before. Now that we’re restocked, you can expect those to be right back in the chart next week. So, the Star DESTROYER went back to number one, which is a familiar location for that disc. The Signature ESP Buzzz (McBeth edition) held a strong 2nd place with the new Colored Glow FD2 coming in a strong 3rd. 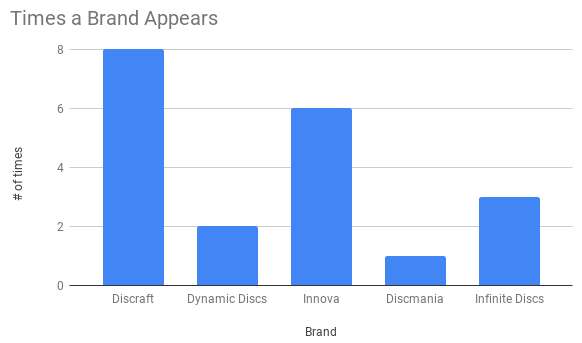 Other popular discs on the chart were the new Star CORVETTE, the Z RAPTOR (still holding on as a new release), the Origion Burst MAIDEN which has been a hot new putter for Westside Discs, and the new GATEKEEPER. Other regulars came back on the chart, like the Star Wraith, Champion Firebird, etc. WINNER – The #6 spot this week was the Star Wraith, making a strong comeback as a popular seller when it comes to drivers. Nobody picked the Star Wraith to quietly come back to the #6 spot, so nobody takes the gift card this week. But give this coming week a try! GIFT CARD PREDICTION FOR NEXT WEEK: Leave your comment below this blog to predict the #4 spot for next week’s chart. 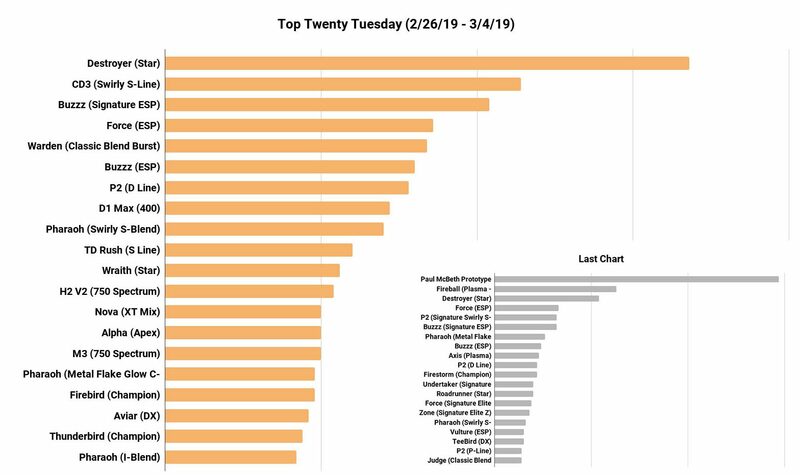 For anybody who knew in advance that the KONG was being released last Friday (which apparently was a lot of people) it was no surprise that that new disc from Discraft’s Paul McBeth line would take the top spot this week. Coming in 2nd place was the Axiom INSANITY in the new Prism plastic– the first time we’ve seen a durable translucent rim on products from MVP / Axiom. The LUNA first run putter followed up closely in 3rd place. In strong 4th place went to the new RAPTOR from Discraft and 5th place went to the ever-popular Sexton glow FIREBIRD. 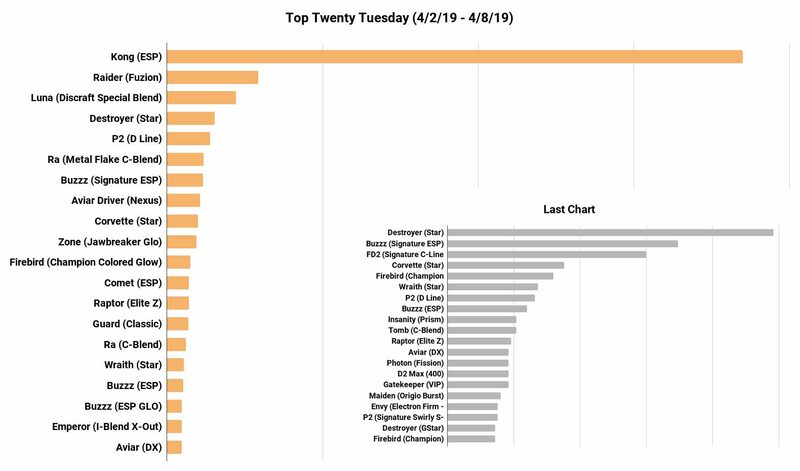 The Discraft BUZZZ mid-range took three spots in this week’s top 20 with strong showings in the McBeth Signature ESP edition, the regular ESP edition, and the regular Elite Z edition. Two other strong movers this week were the Fission PHOTON and the Plasma MOTION by MVP. WINNER – The #5 spot this week was the Sexton Champion Colored Glow FIREBIRD and we had a few people give that disc a guess. We’ll give it to the first three who guessed right, so congratulations to Derek, Christopher, and Clint! It’s a very interesting chart this week, dominated by new releases. The Innova Corvette took the top spot, but followed closely by the signature Sexton Glow Firebird which is still a hot disc. 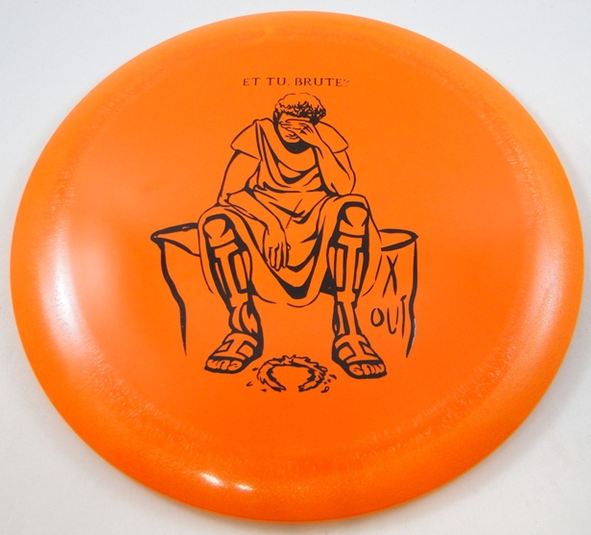 The Destroyer followed up with 3rd place, but close behind was the Infinite Discs Emperor distance driver– probably the first time a brand has introduced a new disc in X-Out (factory 2nd) plastic, but it was too tempting to release the X-Out stamp on the Ides of March (the day Caesar was assassinated), given the new Roman theme of the driver and the dejected-looking emperor in the design. 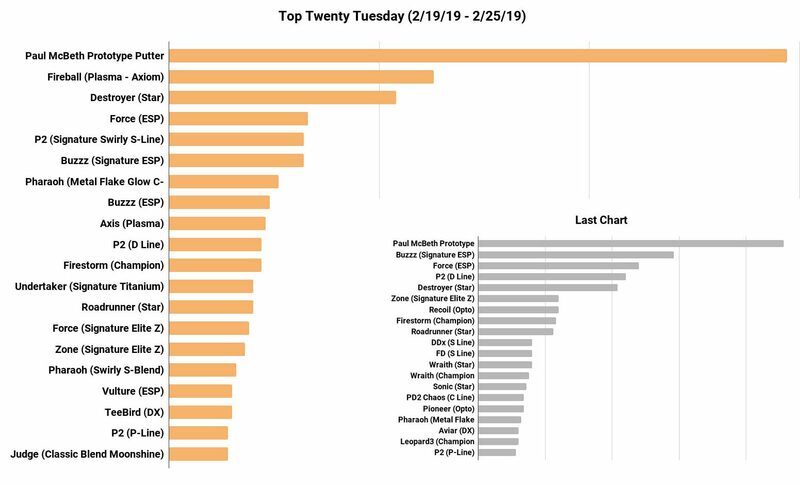 Other new releases that spiked on the chart were the Gatekeeper mid-range by Westside discs, the Guard putter by Dynamic Discs, and the Gote mid-range by Kastaplast which became available in larger quantities. 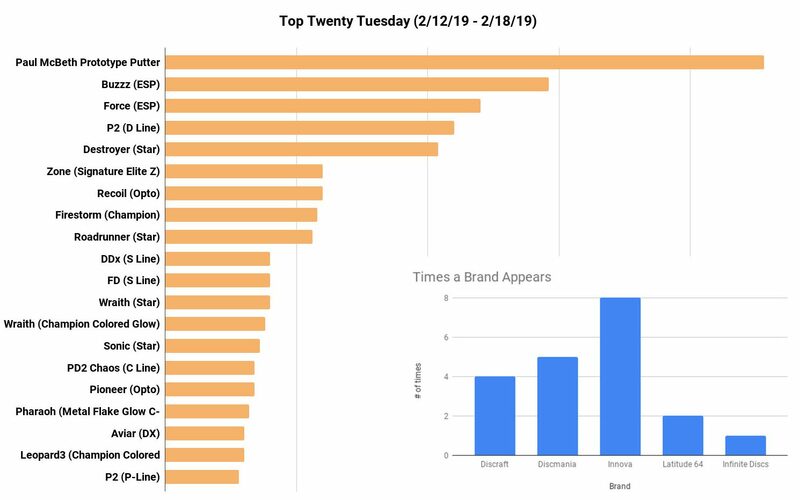 The Falk by Kastaplast also made it onto the chart as that import brand begins to make more waves in the USA. The Prodigy H2 V2 also continued to sell well in the 750 Spectrum plastic with the cool Kevin Jones stamp. That plastic is simply gorgeous! WINNER – The #8 spot this week was the Signature C-Line Glow FD “Night Strike II” by Discmania. Alex boldly predicted the glow FD as the #8 spot this week, which is impressive since it wasn’t on the previous chart. Good job! GIFT CARD PREDICTION FOR NEXT WEEK: Leave your comment below this blog to predict the #5 spot for next week’s chart. 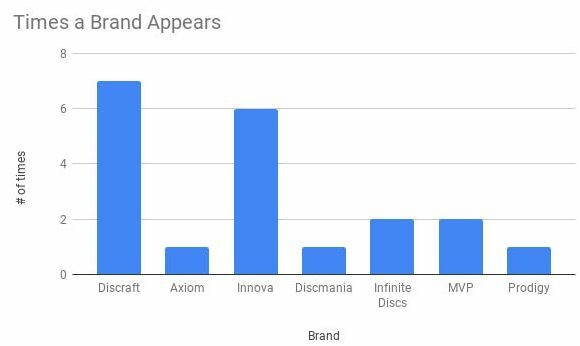 Once again, the Paul McBeth Prototype putter, which we know will be called the LUNA, took the number one spot on the chart, and a couple other Paul McBeth signature discs from Discraft also hit the chart. We see his signature Buzzz at #2 and his signature Zone at #6, plus the ESP Force continues to sell very well. 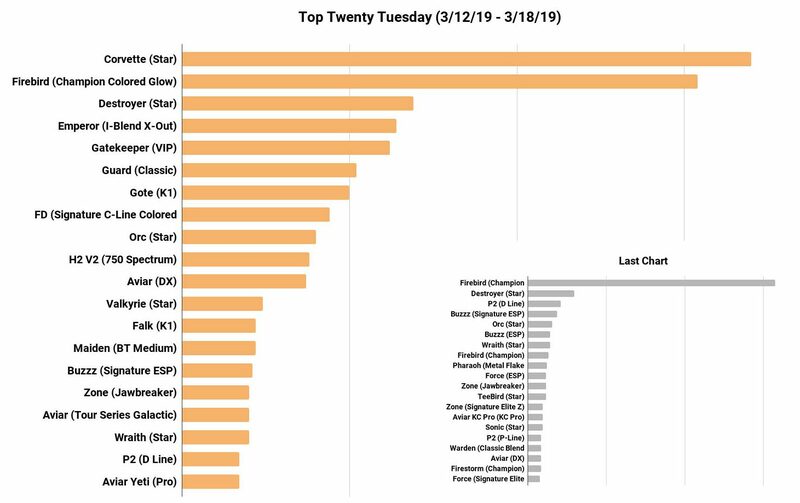 One of the most noticeable things on this chart is that the Star Destroyer is probably the lowest it has been in months at #5. That could have something to do with our diminishing supply at Infinite Discs (we’ll be getting more added to inventory soon). Two new discs from Latitude 64 came out last week– the Opto RECOIL debuted at #7 while the Opto PIONEER debuted at #16. Several other signature discs from Innova hit the store last week, including the Star Sonic, Color Glow Wraith, and more. A special edition of the Champion Firestorm also pushed that lesser-known driver up to the #8 spot. WINNER – Nobody guessed the that the Champion Firestorm would be #8 this week. That would have been a real shot in the dark! That special edition gave a disc that rarely gets close to the chart to the #8 spot. But but sure to guess for next week for a chance at a $10 gift card! 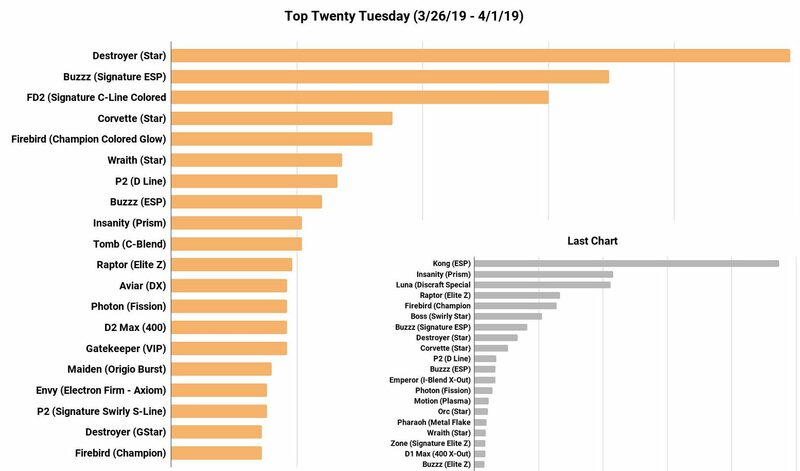 The first thing you may notice on this week’s chart is that multiple Alphas by Mint Discs broke the top 20. Mint Discs released their latest runs of the disc and helped create the spike in popularity. Paul McBeth’s Prototype Putter skyrocketed to #1 and the popularity of his other new signature Discraft discs continue to highlight the top 20. Innova’s Star Destroyer climbed back up to #2, continuing its hold as one of the more popular discs on the market. 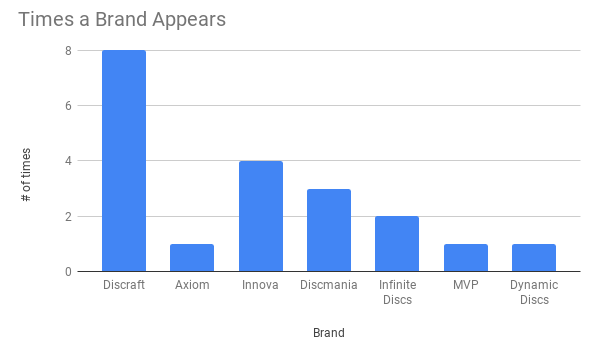 Axiom and Mint Discs were common new comers to the Top 20. Axiom peaked at #9 with their Electron-soft ENVY. Mint Discs new Sublime ALPHA soared to #3 and had two more discs in the Top 20. Innova had the most Top 20 discs with 8 discs being in the top 20.. WINNER – We had three people correctly pick Star WRAITH as the #10 disc. Congratulations to Nick, Clint, and Peter on picking the #10 disc.Thank you to everyone that participated. Keep those guesses coming for this weeks gift card prediction.